Torrey: Ann. Lyceum Nat. Hist. New York 2(5): 227. 1828. 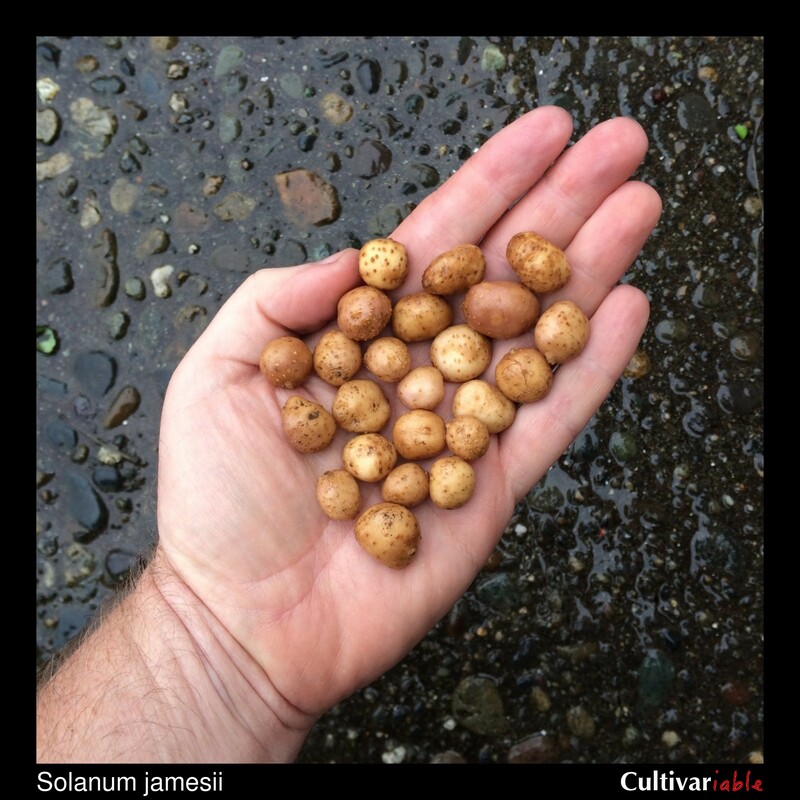 Solanum jamesii (jamesii, honoring Edwin James, a US Army surgeon who first collected the species), sometimes known as the “Four Corners potato,” is a wild potato of the United States and northern Mexico, with a couple of disjunct populations in central Mexico. 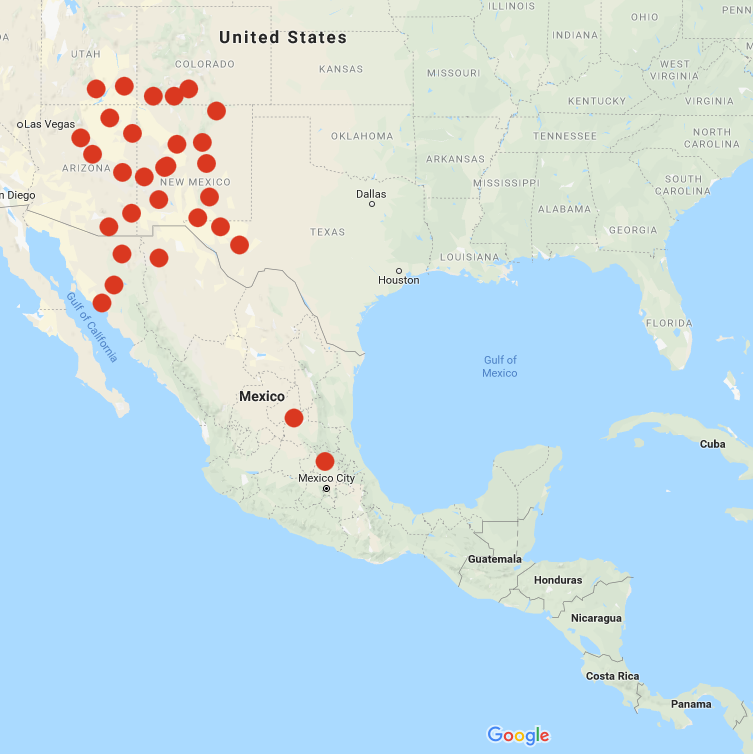 It is the only wild species with a distribution primarily in the United States, where it is found mostly in New Mexico and Arizona, but also reaches slightly into Colorado, Utah, and Texas at elevations above 5000 feet. Plants are small, reaching about 6 to 15 inches in the wild, but taller under cultivation. 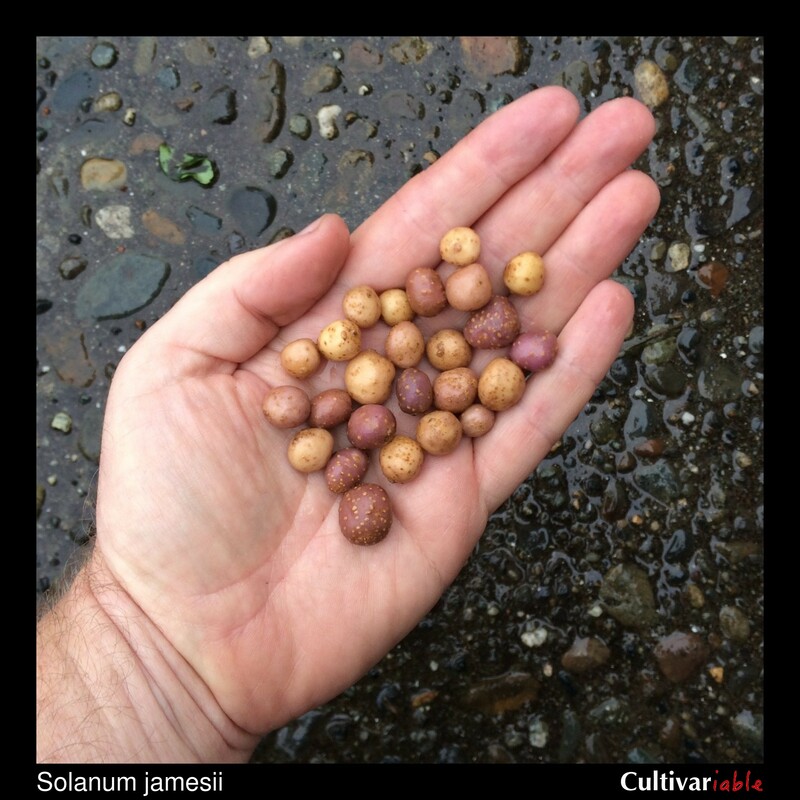 S. jamesii was used for food by native Americans, likely cultivated to some degree, and possibly even improved. Louderback (2017) studied starch grains on ancient pottery and determined that this species was used as food in Utah as early as 8950 BC. If it were used consistently over such a long period, it would be surprising if it had not been improved through selection, even inadvertently. The primary pieces of evidence for its cultivation are (1) that populations are frequently found in close association with sites of previous human habitation; (2) that high levels of genetic diversity in some locations may indicate that plants were collected from other areas (Kinder 2017); and (3) that the tuber size and starch granule size of collections made near known archaeological sites are larger than those of collections not associated with such sites (Herzog 2018). Bamberg (2016) reported that that majority of the genetic diversity present in the USDA collection of this species could be found in one site at Mesa Verde, suggesting the possibility that many different genotypes were brought together there by man. According to Ortman (2018), although it later branched out to include other tuberous plants, the Tewa word sego refers specifically to Solanum jamesii, which must indicate that this was a plant of some importance prior to the introduction of other edible tubers that later were included under the same name. S. jamesii tubers are small, reaching about an inch in diameter, but perhaps twice that under cultivation. The tubers are usually white to tan, occasionally turning purple, apparently as a response to environmental conditions, as happens with many North American species. Tubers can remain dormant for very long periods. Bamberg (2010) found that tubers of many collections would store successfully at 41 degrees F (5 C) for eight years and recounted a story from a landowner who observed plants growing on resumption of irrigation after 39 years. While 39 years seems unlikely, the upper limit for dormancy in S. jamesii remains unknown. 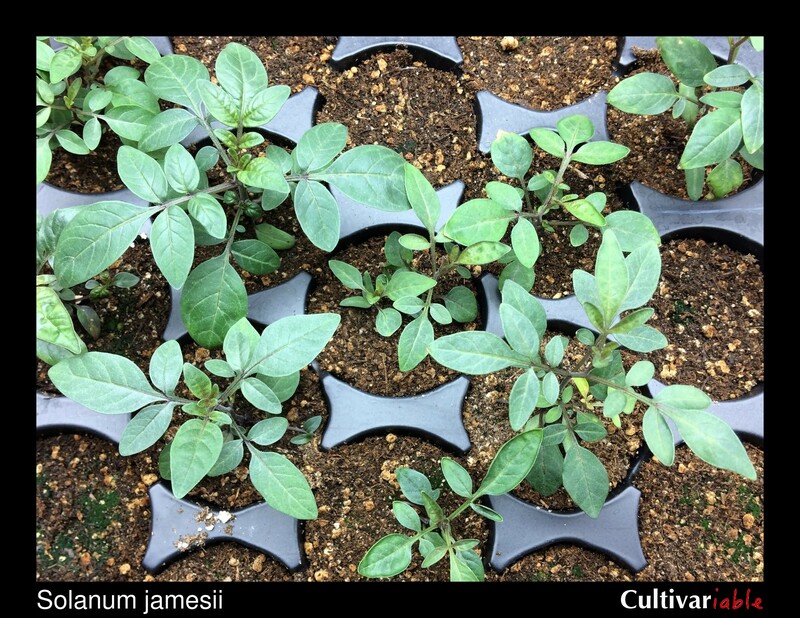 Kinder (2017) reported that wild collected tubers of S. jamesii had twice the protein content of S. tuberosum, along with substantial increases in potassium, calcium, magnesium, and other minerals. These nutrient levels can probably be attributed primarily to the small size of the tubers. Smaller tubers have a greater proportion of nutrient-rich skin and cortex to flesh. Jarvis (2008) predicts that this species will lose 91% of its present range by 2055 due to climate change, most likely entailing a critical loss of genetic diversity. This species can survive frosts down to 26 degrees F (-3.5 C) (Li 1977). Vega (1995) found that this species is less frost tolerant than domesticated potato. Johnson (1937) found that some tubers of this species were able to survive freezing for multiple days. Pelletier (1999) found that Colorado potato beetles have increased adult and larval mortality and low egg production on this species. Some people seem to have some rather romantic notions about this species, based upon the number of inquiries that we receive from people who want to find some to grow as food. Unfortunately, at least some clones of S. jamesii have pretty high levels of glycoalkaloids relative to the domesticated potato. It would be easy to get sick from eating it. Apparently, it was traditionally eaten with clay or processed in some fashion and used dried (White 1944, Moerman 1998) in order to eliminate some of the glycoalkaloids. Many people report eating this species without ill effect and I have done so myself, although I got a few plants with tubers that were noticeably better in 2018. I recommend against consuming large quantities until we know more about its glycoalkaloid content. The most recent study of 15 accessions of S. jamesii found total glycoalkaloids ranging from 8.6 to 20 mg/100g (Nzaramba 2009). These levels all fall within the generally recognized safe upper limit for total glycoalkaloids of 20mg/100g. This information looks positive, but it is only part of the picture. Johns (1990) found levels of 115mg/100g and 128mg/100g for two accessions of S. jamesii. The primary glycoalkaloid was tomatine. This is about six times the generally recognized safe upper limit for total glycoalkaloids of 20mg/100g. Accessions with levels this high could probably be eaten in small quantities without causing distress, but it would not be possible to consume it as a staple without finding a way to reduce the glycoalkaloid content. What accounts for the difference? It could just be genetic differences between the accessions that were tested in each study. It could also be a difference in how the tubers were grown and harvested. Tubers grown in a greenhouse, as they often are for research purposes, can have different levels of glycoalkaloids, particularly if they are protected from pests. Tubers that are harvested before full maturity may also have lower levels. If we assume that 128mg/100g is the upper limit for this species (which is certainly not a safe assumption), then a 150 pound person could probably eat about three ounces without experiencing symptoms of glycoalkaloid toxicity. This is just an example and you should not consider it any kind of guidance for consuming this species. There are no named cultivars and thus no way to know how the glycoalkaloid levels might vary from one plant to another. It is possible that it is overly conservative to assume the same safe dosage for tomatine as for the more common potato glycoalkaloids solanine and chaconine. Green tomatoes, which are a fairly common food, may contain anywhere from 50mg/100g to 500mg/100g of tomatine. Although it hasn’t been studied in humans, this suggests that we may tolerate tomatine better than the more common potato glycoalkaloids. On the other hand, S. jamesii might be particularly dangerous due to inability to perceive the concentration of tomatine in the tubers. The normal expectation that bitterness is proportional to glycoalkaloid concentration may not hold with this species. Johns (1986) reported that Aymara potato cultivators could not detect a significant flavor difference in tomatine solutions ranging from 40 to 80 mg / 100 ml, while they could easily detect differences in the same range of solanine and chaconine. Overall, I think that S. jamesii is probably pretty safe, but we are working with a small amount of somewhat contradictory information, so it makes sense to proceed carefully until we know more. The reports that S. jamesii was traditionally eaten with clay are a warning sign, regardless of what laboratory results say. Solanum jamesii grows in the high desert of the southwest United States and northern Mexico. It is adapted to dry conditions, growing in sandy soils, with hot days and cold nights. In the wild, S. jamesii usually sprouts during the rainy season in July and August (Kinder 2017). Plants flower and fruit from June to October (Spooner 2004). In cultivation, with irrigation, it can be started much earlier in the year. I have found S. jamesii easy to germinate, using the standard conditions for S. tuberosum. Albino or chlorophyll deficient seedlings seem to be common in S. jamesii. The albinos will die as seedlings and the variegated types are inferior and not worth keeping. The USDA potato genebank has observed that germination of some accessions of this species is inhibited by gibberellic acid (Bamberg 1999). Towill (1983) found that seeds of this species stored at 1 to 3 degrees C germinated at 38 to 94% after 15 years. As with most wild potatoes, I recommend growing S. jamesii either in pots or in buried mesh bags to keep the stolons under control. The tubers are small and form on long stolons, so harvest is a frustrating experience at best without some kind of containment. Liter pots or bags work well for this species, although shallower and wider is better than deep and narrow containers. I haven’t had much luck getting S. jamesii to flower in this climate, which is unusual, since virtually every other wild potato flowers well here. Our spring and summer temperatures may be too cool for it. So far, only about 1 in 20 plants have flowered and those only briefly. Bamberg (1995) found that at least some accessions of S. jamesii flower better at high temperatures than under typical temperate growing conditions. Flowering was better when greenhouse temperatures exceeded 100 degrees F for several hours during the day. Pollen viability was also about the same regardless of temperature in several accessions, although markedly lower in others. Trapero-Mozos (2018) determined that this species will tolerate a temperature of 40 C even without prior acclimatization to warm temperatures. As is true of most diploid potato species, S. jamesii is an outbreeder. There is a lot of interest in crossing S. jamesii with domesticated potatoes in order to introduce some of its interesting features like long dormancy to domesticated lines. Unfortunately, it is very difficult to make crosses between this 1EBN species and either 2EBN or 4EBN domesticated potatoes. The most likely way to get there is to cross S. jamesii with a 2EBN tetraploid species like S. acaule or S. stoloniferum, relying upon S. jamesii to produce unreduced gametes. This would yield 2EBN tetraploid progeny. The progeny could then be crossed to diploid domesticated potatoes, resulting in a triploid. Triploids aren’t ideal, because they have limited potential for further breeding, but that doesn’t mean that they aren’t valuable on their own. Progeny from this cross would be 1/3 domesticated and 2/3 wild genetics and, due to the likelihood of disomic segregation in the tetraploid parent, some of the progeny should be 2/3 S. jamesii genetics and 1/3 domesticated potato. Another possibility would be to cross S. jamesii to S. verrucosum, a more closely related 2EBN diploid species. 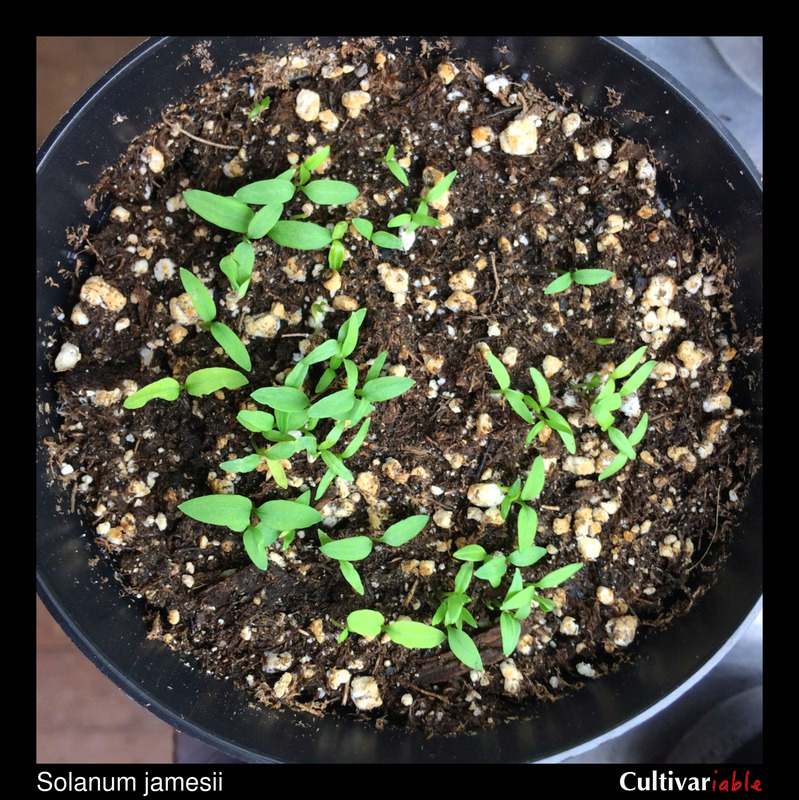 S. verrucosum has shown some ability to cross succcessfully with S. jamesii, although the rate of success is low. Despite the low rate, the progeny of such crosses are 2EBN diploids, providing the ability to cross directly to domesticated diploid potatoes, or to tetraploids through unreduced gametes. Livermore (1940) attempted to make reciprocal crosses between tetraploid S. tuberosum and chromosome doubled S. jamesii without success. This is consistent with what we know of S. jamesii. It is a diploid species with 1 EBN. After chromosome doubling, it would behave as a tetraploid with 2EBN. Because S. tuberosum is tetraploid and 4 EBN, the cross is not compatible even after doubling. Watanabe (1991) found that 7.8% of varieties of this species produced 2n pollen and Jackson (1999) found 1-18%, which would be effectively tetraploid and 2EBN. Regarding toxicity of S. Jamesii., it grows in thisarea. The native people, and others, reccomend eating only newer immature tubers. Just put the old one back. It is much stronger. Thanks Robert, that’s interesting information. That may help to account for the conflicting information about edibility with this species.